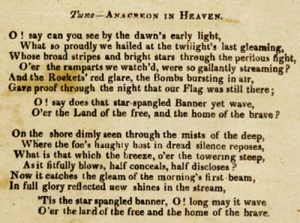 Usually referred to as a poet, Francis Scott Key is more accurately remembered—at least in connection with “The Star-Spangled Banner”—as a lyricist. In fact, he wrote lyrics for a total of three songs and ten hymns. In all cases, he invented words to fit previously existing musical models. This was typical in Key’s era when hand-engraved music notation was expensive, but printing words was common, fast, and pretty cheap. In one strategy known as the broadside ballad tradition, lyrics would be written to match the rhythm and contour of familiar tunes and published as text only in newspapers and books. The melodies for these “broadside ballads” were usually identified by a note just below their title. The most successful of these lyrics went “viral” and were reprinted by local newspapers (all newspapers were local at this time, of course). To download our edition of the sheet music, click here. The melody of “The Anacreontic Song” was used frequently for broadside ballads in Key’s era. More than 80 Anacreontic lyrics appeared in print before 1820. As a poetic form, it was unique. It features eight-line stanzas—four is typical—and these eight lines contain nine rhymes. Each line has an end rhyme plus there is an extra internal rhyme in line five. 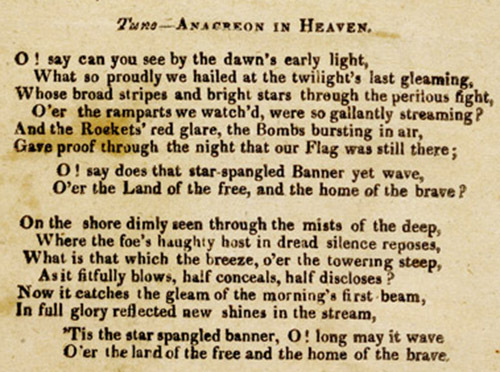 Key’s 1814 lyric has this extra rhyme in the phrase “And the rockets red glare, the bombs busting in air, gave proof through the night that our flag was still there.” It therefore fits precisely the structural model unique to parodies of “The Anacreontic Song.” It is simply implausible that Key could write an eight-line lyric with nine rhymes by chance. Nevertheless, because Key did not preserve for history a first-hand account of his writing of the Banner, others including the musician Ferdinand Durang and Key’s own brother-in-law, the Supreme Court Chief Justice Roger B. Taney, claimed to have been the one to have brought text and tune together. Maybe they noticed what Key had done, but in its day, any and all readers would have understood it to be a broadside ballad and its distinctive line and rhyme scheme fit one and only tune, a popular melody that Key had used before—”The Anacreontic Song” (Click here for video; here for sheet music). This entry was posted in F.S. Key, Fort McHenry, Fort McHenry, History, John Stafford Smith, Mark Clague, Melody, Mythconceptions, SSB Videos. Bookmark the permalink.